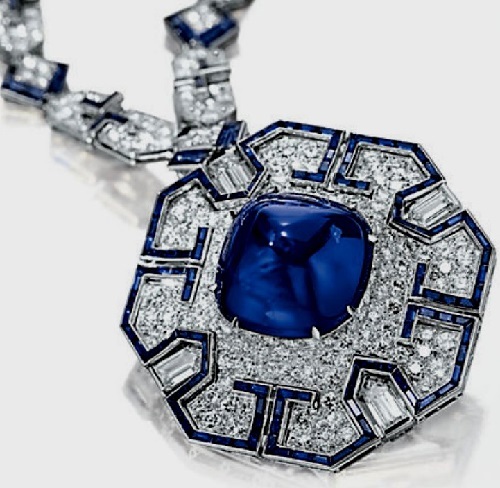 The Golden Age of Hollywood joined the sapphire craze and created amazing pieces that still inspire awe and appeal. Mary Pickford, screen star of the silent film era, adored star sapphires. Taking a page from the royal’s playbook, celebrities of Hollywood have long esteemed sapphires as a favorite gemstone to wear and collect. 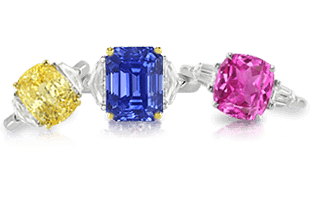 From screen sirens of the 1940s, 50s, and 60s, up to modern-day Hollywood royalty, the allure of sapphires is legendary. For many, it is in the choosing of a non-diamond engagement ring. 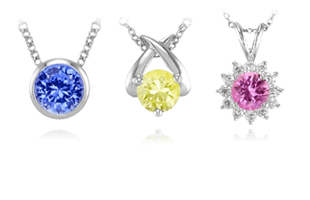 For others, this meant building a substantial sapphire collection with many special pieces. 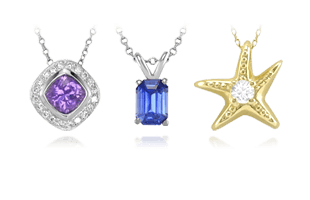 Regardless, it is clear that sapphires have been embraced by the Hollywood elite in some truly standout ways! 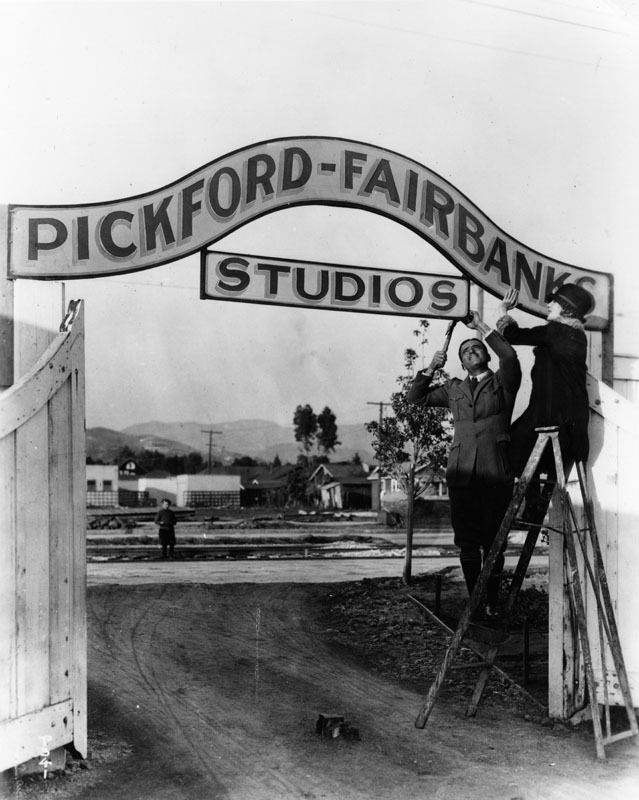 The newlyweds Mary Pickford and Douglas Fairbanks, Sr. adjusting the sign over the gates to their studio. 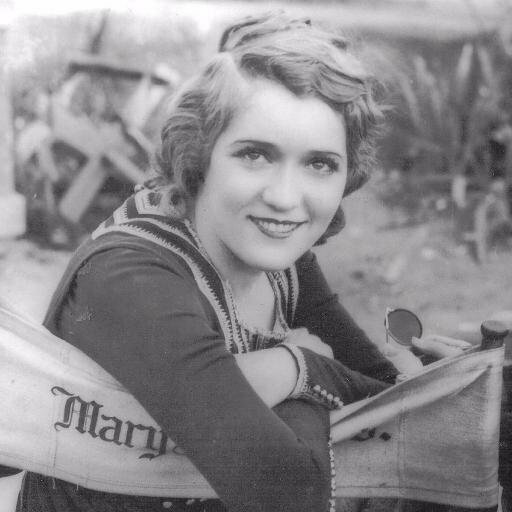 Mary Pickford, the famous silent screen siren, was known as the first movie star in Hollywood. She was a groundbreaking actress, even forming her own studio and production company, co-founding United Artists. Pickford was also a lover of rubies and star sapphires, collecting many special pieces throughout her lifetime. 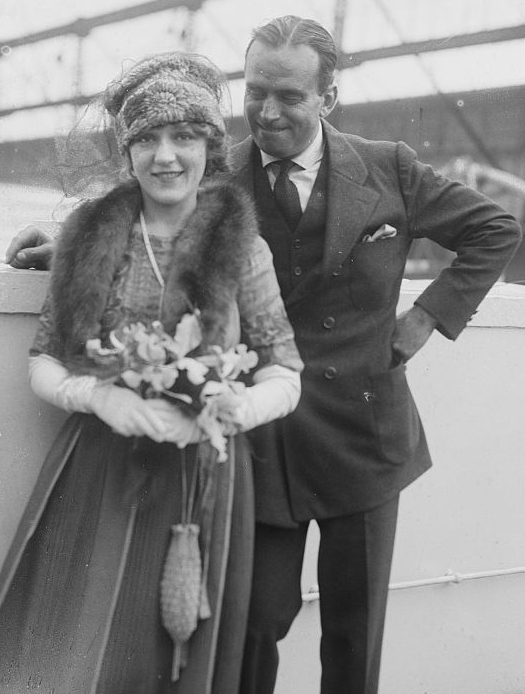 Pickford and renowned actor of the era Douglas Fairbanks, Sr. had a tumultuous love affair and marriage during which they lavished each other with gifts. One of the very special items Fairbanks gave Pickford in 1920 was a stunning 182 carat blue-violet star sapphire from Sri Lanka set in a platinum cocktail ring. Pickford and Fairbanks on their honeymoon. Known as the “Star of Bombay,” the sapphire quickly became one of Pickford’s favorite from her jewelry collection and a piece she wore extensively. Upon her death, she bequeathed the beautiful blue-violet “Star of Bombay” to the Smithsonian Institution in Washington, D.C.
Mary Pickford wasn’t the only screen star of the early film era to covet star sapphires; they were actually something of fad at the time, and many believed there was a competition among the leading ladies of the time to procure the largest star sapphire. Carole Lombard wearing one of her star sapphire rings in one of her films. One of the most popular stories reported on in all the magazines involved the engagement rings proffered by actor William Powell to two of the era’s largest stars: Carole Lombard and later Jean Harlow. When Lombard and Powell married in 1931 it was with the addition of an 80 carat blue star sapphire ring to Lombard’s finger. Another gift included a brooch composed of two star sapphires surrounded by diamonds. Although the marriage didn’t last longer than a couple years, the two remained close and Lombard continued to wear her star sapphires with regularity. 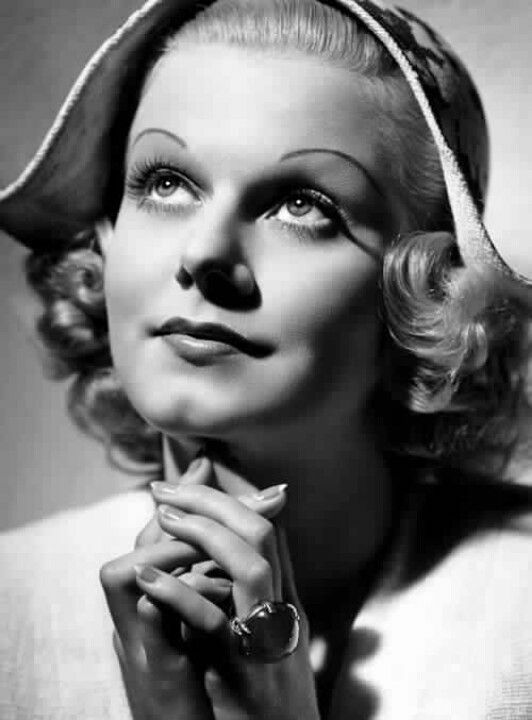 Jean Harlow posing with the star sapphire ring gifted to her from William Powell. Powell would follow his relationship with Lombard with another lover of star sapphires, Jean Harlow. Their unconfirmed engagement culminated in the presentation of a 152 carat blue star sapphire ring set with some substantial diamonds. Tragically, Jean Harlow died in a plane crash a few months after the gifting of this ring. 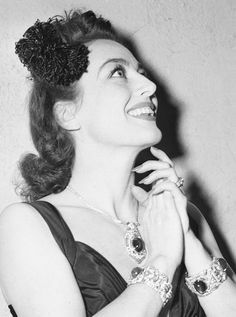 Joan Crawford wearing her prized pieces featuring star sapphires. Joan Crawford loved sapphires so much that newspapers and magazines of the time began calling her “Joan Blue.” She received a 70-carat star sapphire engagement ring from her second husband, Franchot Tone, which she often wore with a second 72-carat emerald-cut sapphire. Crawford also had a stunning bracelet set with three star sapphires of 73.15, 63.61, and 57.65 carats that she wore often, including in her films. Many other leading ladies of the screen from the early 20th century had impressive collections of sapphire jewelry, specifically star sapphires, including Mae West, Vivien Leigh, and Claudette Colbert. Elizabeth Taylor’s sapphire and diamond sautoir set with a 52.72 ct sugarloaf cabochon sapphire. Taylor wearing the Bulgari necklace gift from Richard Burton on her 40th birthday. 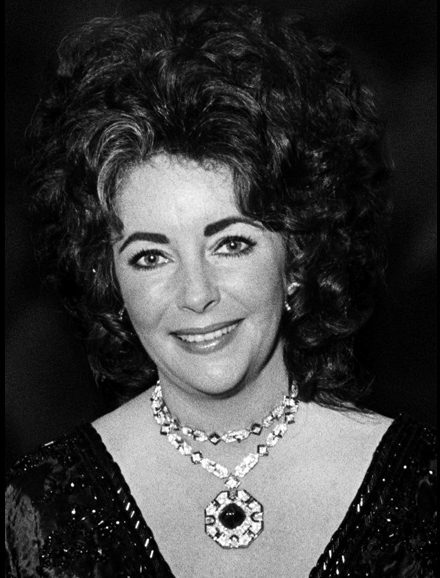 Elizabeth Taylor, an avid collector of one-of-a-kind gems, was given multiple special sapphires throughout her life. Her second husband, Michael Wilding, presented Taylor with a large cabochon sapphire engagement ring. She also received many additional sapphire pieces from Richard Burton, onetime husband and longtime love, including a Bulgari sapphire necklace and sapphire sautoir, as well as sapphire and diamond earrings and rings. In modern day Hollywood, the sapphire engagement ring has been experiencing a resurgence in popularity with a mix of classical, modern, and vintage designs. Close-up of Elizabeth Hurley’s sapphire engagement ring. In 2011, actress and activist Elizabeth Hurley announced her engagement to Australian cricket player Shane Warne with a square-cut blue sapphire flanked by two trillion-cut white diamonds set in gold. With the sapphire around 9 carats, it’s a stunning ring with a beautifully classic appeal. Close-up of Penelope Cruz’s vintage sapphire engagement ring. Another European actress, Penelope Cruz, received a vintage 3 carat sapphire halo engagement ring upon her engagement to actor Javier Bardem. The actress is said to love art and fine antiques, so a vintage sapphire ring with the center stone surrounded by a delicate floral design set with diamonds, is the perfect choice. 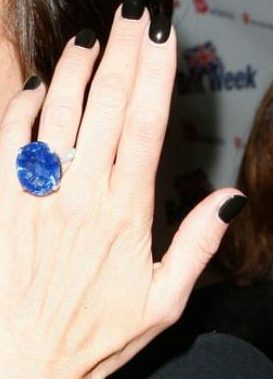 Close-up of Victoria Beckham’s huge sapphire ring. Victoria Beckham has been receiving engagement rings from her husband David Beckham throughout the entire twenty years of their marriage. It is believed that the number of engagement rings rests somewhere around 14 rings at this point, including a few sapphire rings, one of which is a stunningly large oval blue sapphire, estimated to be upwards of 15 carats. Close-up of Gwyneth Paltrow’s stunning solitaire sapphire engagement ring. Most recently, Gwyneth Paltrow has joined in the sapphire engagement ring love with her ring presented upon her engagement to Brad Falchuk. A large round blue sapphire solitaire ring, likely set in platinum, and estimated at around 12 carats, the ring is a true statement piece and a standout with a modern feel. 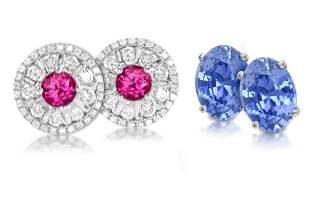 Although we have seen some large sapphires owned by many in Hollywood, there are so many more, and we will explore them next in The World’s Largest Sapphires | A Guide to the World’s Famous Named Sapphires.